This is the second interview in my series “life behind the squares” where I peak behind the Instagram façade to find out how people really live their lives. Of course, we all put our own spin on what we allow others to see, so it’s always interesting to learn more than what can be conveyed in a beautiful image or thoughtful caption. Elizabeth was one of the first people I followed on Instagram (in a kind of stalky way), I wanted to be her and have the creativity she has! I have seen her go from strength to strength in the year we have been in contact and all this whilst having her third baby, wonder woman no less. I adore her colourful images and ever evolving use of textures and tones. And I dream of running a workshop in her late uncles beautiful but fading house. Until that becomes a reality, let’s hear from Elizabeth on her life and loves. I absolutely love your unique, rich style. How has it developed over time and do you feel happy with where it is now? Thank you for you kind words. My style has definitely developed over the past couple of years. I think I have added layers, as in started off with the simple love of flowers and colour. Over time I have gained confidence to add in the extra elements I’m drawn to, maybe it’s the worn step, extra texture which could be any form from chalk to mustard powder, a little more colour I can’t help myself, and full on mess really. My Instagram style isn’t minimal and that’s me in real life, my home is a collection of things I love. I’m a magpie collecting any old random bits and pieces and I mix them about set them out take them away but ultimately I like to visually surround myself with things that make me happy. I think that’s what I do in my pictures now I add in details on the day that I enjoy and go with that. You have a very engaged following on Instagram, your posts consistently perform well and you continue to grow your community. What has been the best thing for you since joining instagram? The best thing since joining Instagram is the freedom and opportunity to create with a community who supports, cheers you on and pushes you to try more. Where else could I share pictures of herbs and spices mixed with flowers and my barn steps. I get so much out of creating, it gives me head space in my day. To be able to connect with a warm bunch of people who respond with kindness is just so hearting. It’s hard to describe to someone who doesn’t Instagram how really genuinely lovely the community is. I am fascinated by life on your farm. I used to always want to be a farmer, I still do in many ways! can you give us a little insight in to the realities of life on a farm? Farm life is busy, always jobs to do and no such thing as clocking off. It’s a great way of life, and the children adore outside. A dream would be for me to take part of the land over and have a seasonal flower farm. I’m not sure how the cows, sheep, and chickens will feel about this! I draw a lot of inspiration from the farm and all that comes with it, mainly the rusty gates, weathered machinery and how as the seasons change the colour and feel on the farm changes. You will see on my gallery a picture of some rusty old tin that was sitting on an old trailer up in the yard. My little boy and I were outside one evening when I spotted it and the colours of the rust drew me in. You share my love of flowers, what is your favourite flower and why? I couldn’t pick a favourite flower it’s too hard, last years poppies stole the show for me closely followed up by daisies, cornflowers, ranunculus, anemones you get the drift I like them all. The ones that are a bit unruly, wild and free are my favourites. you are a busy mum of 3 beautiful children, what do you do to get those moments to yourself, where you can be free to create? Free moments with 3 children isn’t easy. It’s that age old if you want something bad enough you make it work. When the youngest 2 nap and my eldest is at school I forget the housework and just spend the half hour creating. Often I never share the pic, but that’s not always important it’s just the act of doing. It clears my mind, I get a sense of satisfaction from doing it. At the minute the days are pretty busy, creating is my escapism and I can do it all from my doorstep (which as you know I often do). Who do you draw inspiration from, either digitally or in real life? I draw inspiration from lots of sources, goes without saying my surroundings, the weather and the seasons. I feel in recent years I have woken up to my surroundings, my eyes are always on the look out for inspiration. Normally something that tells a story draws me in. If you were granted an extra hour an day, to spend how you wanted, what would you do with the time? An extra hour a day honestly at the minute I would just enjoy the quiet with a cup of tea. No scrap that I will have plenty of time for quiet in years to come. 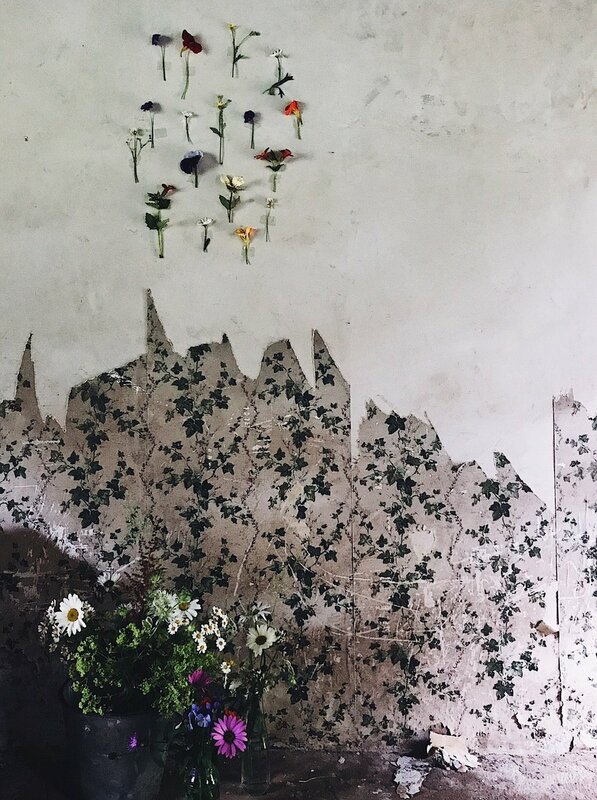 Now you have asked - I have had in my head I would love to try and do a mini installation in an old house on our farm. 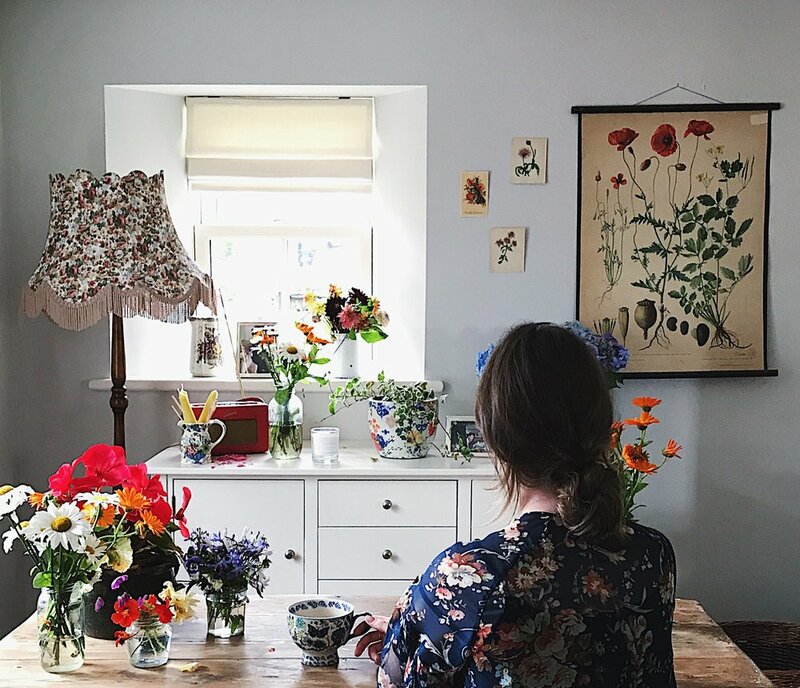 Lots of greenery, flowers in buckets, the wind rattling through the old windows, I could do that and then sit with my cup of tea just enjoying the scene. Win win. Maybe even take a few pictures along the way. For those who are just starting out on Instagram, do you have any advice based on your past experiences? Thank you Elizabeth, it’s been fascinating to learn more about you and your life. I look forward to seeing more of your beautiful images in my feed and to watch how you grow this year. You can read more Behind the Squares interviews here. And please do let me know if you’re enjoying these by leaving me a comment below and if you would like to be part of it or have a certain someone you’re dying to know more about give them a shout out! I'm always on the hunt for more interviewees!